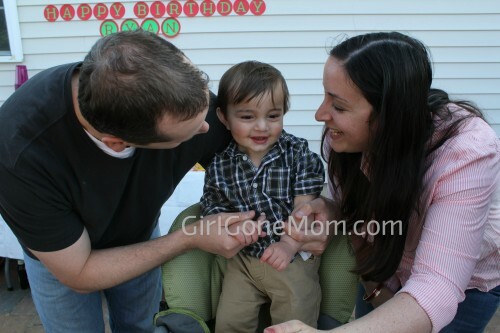 The weekend before last, we celebrated Ryan’s first birthday with a little shindig at our house. 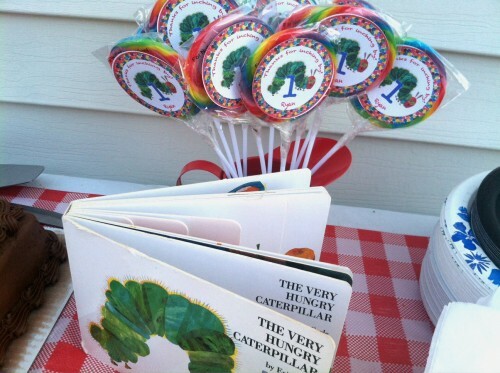 I’d fallen in love with the Very Hungry Caterpillar theme for his big day. 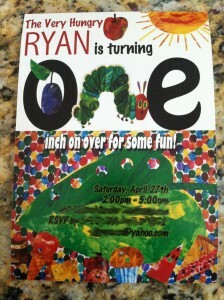 The Invitations & Decor: I designed the Very Hungry Caterpillar party invitations about a month in advance. The design took a few days, but after that was done I printed them as 5×7 matte finish photos and picked them up at Costco — cheap and easy at 13 cents a print! After the endless amount of work I did on Emma’s Tangled party, I knew I wanted to scale it back a bit but I still wanted to carry the theme with small details. So I designed food labels, printed them on textured card stock and hot-glued them to food picks. Then I made circular thank you favor tags which I taped onto swirl lollipops. Throughout Ryan’s first year, I took monthly photos of him in his bedroom glider. I wanted to make a display of him through his first year so I decided to use those photos and what better way to display them than with a hungry caterpillar? The circles for the caterpillar and the birthday banner were cut using a friend’s cricut machine. I really need to buy me one of those. The poster paper was really cheap – three sheets for 69 cents each. I also bought yellow and green paper lanterns with the intention of making a hanging caterpillar, but time just didn’t allow in the end. 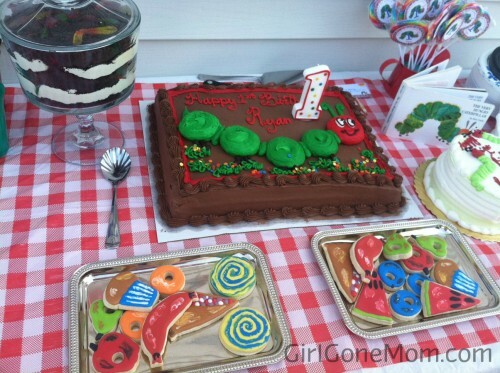 The great thing about having a non-winter birthday is the possibility of an outdoor party. For once we lucked out with the weather, 70 and sunny. 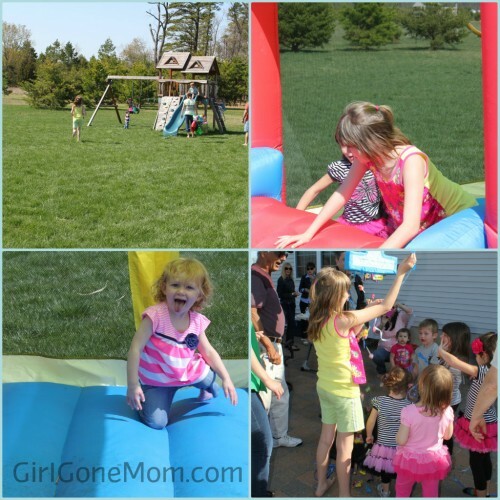 We put out the bounce house and the kids played in the yard, on the swing set and with Emma’s motorized car. The piñata was a big hit too. I served cold cut platters with rolls, tuna, salad and potato salad for the picnic-style luncheon to go with our caterpillar theme. 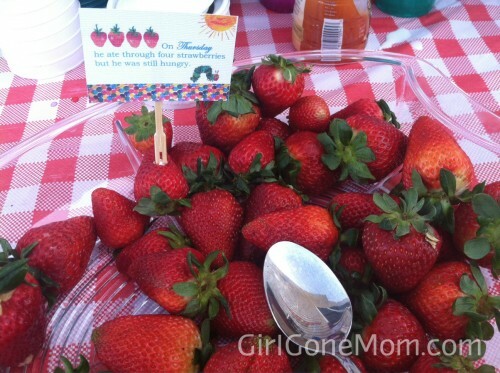 I spent about a third of what I would have by making the platters myself – it was easy and fun! 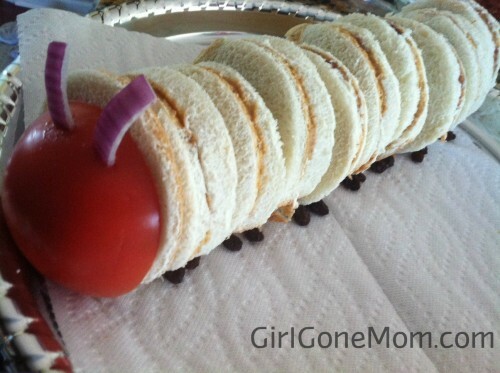 Peanut butter and jelly caterpillar for the kids. I used a round cookie cutter to cut the circles and then I added onion feelers and raisins for the feet. I also served different appetizers and snacks and as usual I prepared more than enough food. I always worry there won’t be enough. You never want guests to leave hungry – ‘better to have too much than too little’ is my motto. The dessert table is always my favorite thing to theme. This time I kept it simple: a caterpillar cake, dot sprinkle cupcakes, dirt cake, Very Hungry Caterpillar cookies and strawberries. Ryan was in rare form that day, and the only moment he really seemed to enjoy was when we all sang ‘Happy Birthday’. He didn’t eat or even smash any cake or act like his normal funny/playful self. Guess he was a tad overwhelmed. It’s tough being a one-year-old.